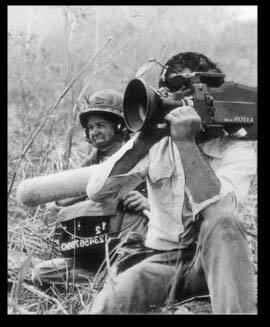 When the Mountains Tremble (1983) is an incredible documentary. 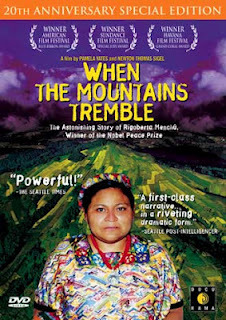 It tells the story of state repression, under the leadership of General Efraín Ríos Montt, of indigenous populations in Guatemala during the 1980s. The filmmaker is Pamela Yates (bottom right) of Skylight Pictures, an IntLawGrrls contributor. Narrating this documentary about the war on Guatemala's Mayan population is Rigoberta Menchú (left). Then in her early 20s, Menchú would go on to win the Nobel Peace Prize in 1992. 'be bold and spread American enterprise throughout the hemisphere'. Beyond asserting US responsibility in providing finance and weapons to the Guatemalan military, Mountains also looks at the complicity of religious organizations in a massacre. Following repression of some priests within the Catholic Church, evangelical groups from the US began to arrive. Throughout the story, we witness the organization of el pueblo guatemalteco, the people of Guatemala. It is these people who star in this film, risking their lives to tell the stories of repression and mass human rights violations. We see training exercises of the guerrillas, the activism of young men and young women who wish to protect their people and who strive for equality. This powerful documentary, exploring the multifaceted factors which lead to genocide and human rights violations, currently can be viewed free online at PBS here. In my post tomorrow, I'll review Yates' 2011 sequel to this film – another documentary, entitled Granito. "Women are leading United Nations efforts"
Do Plain Packaging Laws Invite IP Piracy? Write On! "International Rule of Law"
10th anniversary of the "Torture Memos"